Inside the cabin, you’ll appreciate the rustic leather and wood furnishings, as well as the tile and granite surfaces. You can still take in the view through the amazing wall of windows, or cozy up next to the stone fireplace. There’s a hot tub on the deck, and a double waterfall feature for the master tub. For a little excitement, turn on the HD TV and play a game of pool, or explore the rest of the spacious cabin and find out how much more there is to enjoy! Small families that want absolute privacy in a rustic cabin with amazing outdoor space and offerings. River Wilds includes 4 guests as part of the rental fee. 5 guests will add $10/night to your total, and 6 guests will add $20/night to your rental fee. Nice,easy,very helpful people. The cabin had everything you needed not to mention it was beautiful and peaceful. Beautiful cabin and secluded. The reservation process was extremely easy and the lady I spoke with was very nice and helpful. The cabin exceed our expections. We had a great time! Thanks to Cedar Creek Cabins we created lasting memories. It was the perfect get away for my faintly. So peaceful, clean, and beautiful. I have already recommended it. 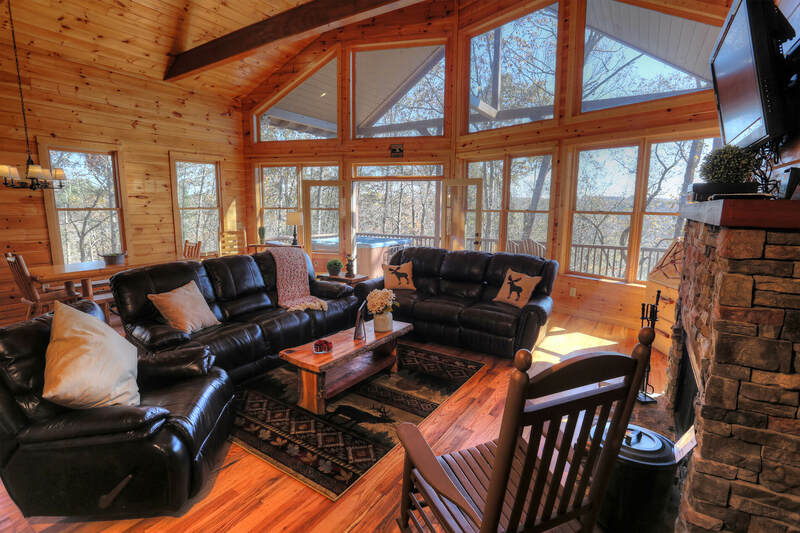 Gorgeous cabin with beautiful amenities: perfect getaway in nature. The cabin was easy to find, and Cedar Creek Cabins were so helpful with providing all the info we needed ahead of time for a smooth stay. We loved it! Cabin was beautiful and exactly as advertised. Booking was easy and convenient. Extremely pleased with all aspects. The cabin was gorgeous. The isolation was exactly what we were looking for, for our romantic getaway. We had an awesome vacation there! Beautiful house and view and off the beaten path very private.